Before I leave you this evening I’d just like to say a Happy New Year and all the best for 2013 to anybody who reads this blog. It doesn’t get masses of hits each day but the main idea of setting it up in the summer was to get rid of that isolated feeling that can often come with writing, the idea that you’re writing for nobody but yourself. The thing is, it’s working and I hope next year brings many more conversations about storytelling. 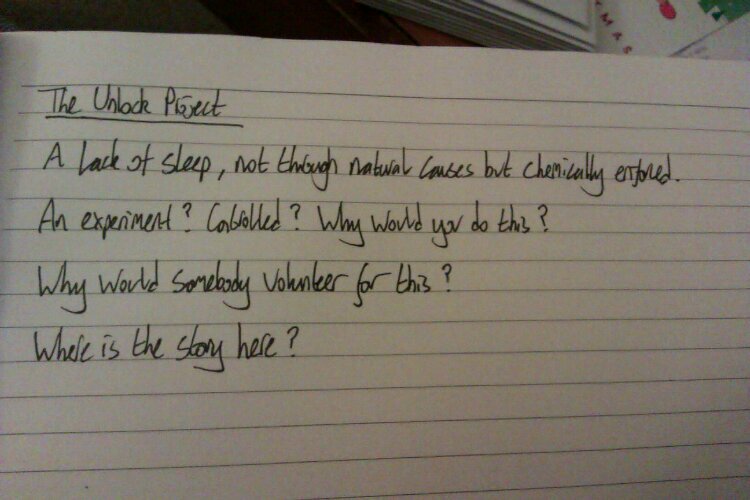 I sat with the notebook last night and bashed out some development ideas. Once again, please excuse my scribble like hand writing. It’s random bits at the moment (and I admit that these photos aren’t exactly the most interesting) but WordPress blogger irscriptwriter gave me the idea about basing the story on finding out what is causing this main character’s lack of sleep rather than make it a feature of the story and write around it. Groundhog Day was mentioned as an example because it’s never explained why Phil is repeating the same day over and over again, he just is and the film hangs on it very well. Also, I’m looking into putting a second character in if only just to have something to hold conversation with and push the story forward. It does lead to the obvious question of how trustworthy this second person would be. As a third point I’ve said before that I want to avoid the whole ‘it was only a dream’ ending. It just seems like far too much of a cop out if I’m investing in this much of a set up. What if the stranger parts of the story turned out to be the real thing though? Can we go from fairly normal to strange and then find that the start of our story was a dream rather than the ending? By this time I got a little tired of all the questions, as you can probably tell. I think, we have a very vague skeleton forming for this story. 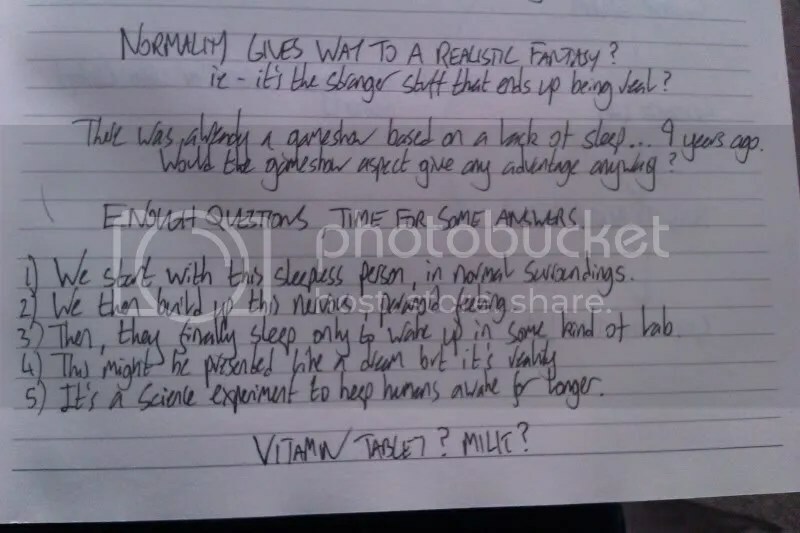 You’ll note that I’ve put ‘VITAMIN TABLET? MILK?’ right at the bottom, this was simply because I’m thinking that if this is a science experiment then they’d have to administer the drugs somehow. Would they be disguised as something normal? I then flipped the page and sketched this. The script order that gives us a first hint of the ending. I kind of like the idea of our main character getting to sleep, waking up to discover that they’re in a science lab, falling back asleep only to awaken again still in the lab. It flips things nicely. I’ll probably spend a little more time getting all this together and then start on building up my characters. As you’ve noticed, I have to work out what ‘stuff’ is first. Feel Like Watching A Movie Tonight? You might remember I mentioned the movie ‘Moon’ a couple of days ago as a reference point to The Unlocked Project. This is therefore just a brief heads up to say that, if you’re in the UK, then they’re showing it on BBC2 at 10pm tonight. It’s also followed by ‘Blade Runner-The Final Cut’ which I’ve set my DVR to record. Once I get a chance to watch that again I’ll no doubt be blogging about my love of Ridley Scott’s classic. A lot of script ideas and thoughts occur to me whilst I’m in the shower (I am actually showering at the time, I don’t just stand under it with a pad and pen because that would be crazy). This morning I was thinking about The Unlocked Project and the current problem of why this main character would be sleepless. A sudden lightening strike of a dream happens whilst I’m soaking my hair. What if it’s a competition on TV? What if there’s a promise of a grand prize at the end for staying awake this long? Wouldn’t there be cameras all over the place filming this televised experiment? It might seem a bit Big Brother but it’s almost believable that some station somewhere would broadcast something like that. Although it does give an easy license to play about with what is fantasy and reality within the story I’m still trying to avoid the ‘it was a dream all along’ ending. It was certainly an eye opener which is probably why I got shampoo in my eye. I work in an opticians, arriving with a red eye ain’t a good look. A Google search for ‘sleep deprivation’ has thrown up more rat based lab testing than I cared to read about. From Wikipedia (I know, but it’s not a research paper we’re doing here so it’s okay). 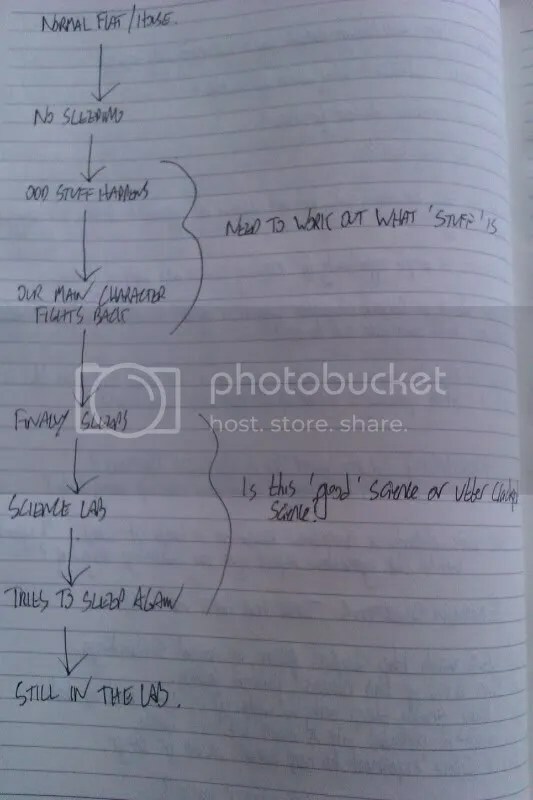 So far so scientific, I usually go though these phases of attempting to research for details of the script. It’s fun and it does seem to grant you a huge supply of otherwise useless information but the problem persists that there’s currently no story here. I have a man who isn’t sleeping and there’s still the question as to why this is. I like the idea that it’s not something he’s going against (and I’m automatically saying ‘he’ at the moment under the impression my lead character is male but this could obviously change). I’m still struggling for a reason why though. It has gone through my mind that it can be military based as there would obviously be an advantage of having a soldier who never needed to sleep. It lacks resistance as an idea. By this I mean there’s a complete lack of conflict right now if this character is just going along with this enforced insomnia. Somewhere, somehow the set up will have to be broken. Every single idea starts this way, a few scribbled lines in the notebook. It’s a way of mapping out the first few thoughts. I had a short story idea a while ago about a central character who couldn’t sleep. It sounded a bit thin of a premise and insomnia has been used before in many a story as a basis for paranoia. 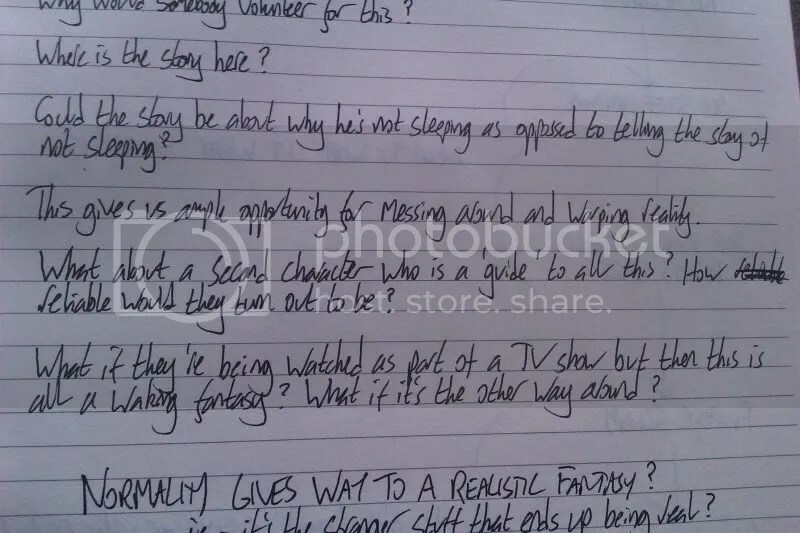 What then, if the central character was being kept awake on purpose? For research? For some kind of scientific project? The other consideration is that it must be cheap to film which means one set and as few characters as possible. I want somebody make this at the end, a massive budget would put anybody off. It a great challenge for a writer to think on these boundaries. I remember a local news story about a young film maker who offered the medical use of his brain on eBay to raise money for his ‘Lord of the Rings inspired epic’. The story was about how he was stopped from doing this as eBay counted it as selling body parts. My point would be though that he was either copying Peter Jackson with £10 in his pocket or he thought his brain was worth £100 million. 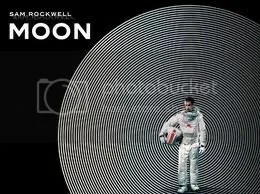 My first port of viewing for a cheap, single character sci-fi film for the basis of this script would be ‘Moon’ directed by Duncan Jones and starring Sam Rockwell. Go watch, you’ll soon get the vibe. At the moment I’m feeling a small sense of achievement about the progress I’ve made with writing this year. I’ve had a play performed on a very small scale, my full length theatre script is currently being read over by a couple of development teams and ‘Robotics For Morons’ is currently filming and should be ready at some point next year. Whilst I’ve sat and planned out a feature film in a basic way I’m thinking I want to write another short movie in order to keep the ball rolling whilst I hide myself away and write the larger script. If the shorter script is being read and I can get feedback from that whilst writing the feature then it should stave off those slightly isolated feelings. But then I had a thought. There’s always the problem of writers holding onto ideas, keeping a grip on them and never letting anybody else see them. They’ll be full of “Oh it’s about something with someone meeting somebody” in the vaguest possible way. They don’t want anybody to read their script for fear that they’ll steal this fantastic, revolutionary story and then make millions off it leaving the original writer sleeping under blank sheets of A4 paper in a street corner somewhere. What if we did things a little bit differently? What if every step of the process, from idea to page, was put online for all to see? Why do we lock up script ideas when we should be getting feedback from others reading it through? What would happen if we detailed every tweak and rewrite right until the script is picked up? I’m aiming to write a 20-30 minute movie from scratch soon, I’ll be putting up every step on here. I have no idea how this will turn out.